A longtime faculty member of Rutgers University, Dr. Fodor was at his death the State of New Jersey professor of philosophy there. His work, begun in the 1960s and dovetailing with linguistics, logic, semiotics, psychology, anthropology, computer science, artificial intelligence and other fields, is widely credited with having helped seed the emerging discipline of cognitive science. … Known for his buoyant, puckish, at times pugnacious writing style, Dr. Fodor was the author of more than a dozen books, several intended for the general reader. Among the best known of these is “The Modularity of Mind,” published in 1983. … After graduating from Forest Hills High School, he received a bachelor’s degree in philosophy from Columbia, where he studied with the philosopher Sidney Morgenbesser. He earned a Ph.D. in the field from Princeton, where he was a disciple of the philosopher and mathematician Hilary Putnam. Dr. Fodor taught at M.I.T. from 1959 to 1986. He was at the City University of New York Graduate Center from 1986 to 1988 before joining the Rutgers faculty. Throughout his Rutgers years, he maintained his residence on the Upper West Side of Manhattan for its proximity to the opera, an abiding passion. Jerry was a graduate student at Princeton, working with Hilary Putnam (see my 4/3/16 posting about Hilary), when I was an undergraduate there; Jerry Katz was there at the same time, also working with Hilary; and my senior year adviser at Princeton, Paul Benacerraf, was also a student of Hilary’s. Then the two Jerrys went on to teach at MIT, where I ended up taking two seminars from them. My other teachers at MIT included Noam Chomsky, Morris Halle, Ed Klima, and Paul Postal, whose names will reappear below. Those early years at MIT were indeed exciting times, full of what we saw as new ways of thinking, of discovery, and also of fruitful contention. Jerrold J. Katz (14 July 1932, Washington, D.C. – 7 February 2002, New York) was an American philosopher and linguist. After receiving a PhD in philosophy from Princeton University in 1960, Katz became a Research Associate in Linguistics at the Massachusetts Institute of Technology in 1961. He was appointed Assistant Professor of Philosophy there in 1963, and became Professor in 1969. From 1975 until his death, he was Distinguished Professor of Philosophy and Linguistics at the City University of New York. Jerry Fodor’s widow, Janet Dean Fodor (a 1970 linguistics PhD from MIT), is a distinguished (experimental) psycholinguist at CUNY. Jerry Katz’s widow, Virginia Valian, is also a distinguished psycholinguist at CUNY (specializing in language acquisition, however). I now come to Katz and Fodor 1964, a collection of readings by 13 authors (several with multiple contributions): in alphabetical order, Carnap, Chomsky, Church, Fodor, Halle, Harris, Katz, Klima, Lenneberg, Postal, Quine, Stevens, Ziff. (Of these, 6 were my teachers at MIT, and Church was one of my Princeton professors.) All were living when the volume appeared. Only Chomsky (now 89), Halle (94), and Postal (81) survive today. One generation passeth away; the old order changeth. Kenneth Locke Hale (August 15, 1934 – October 8, 2001) was a linguist at the Massachusetts Institute of Technology who studied a huge variety of previously unstudied and often endangered languages — especially indigenous languages of North America, Central America and Australia. Although some linguists might deny initially that they are interested in the “philosophy of language” or that the latter is particularly germane to their concerns, few, if any, would persist in their denial upon learning what the book under review is in fact about. This book is an absolute must for linguists, as well as for philosophers of either of the two persuasions dominant in recent philosophy of language. It is an anthology of writings whose total represents a viable alternative to the competing ordinary-language and positivist philosophical approaches to the study of language – an alternative, however, which is made possible not by recent insights in philosophy but rather by recent work in linguistics proper, principally in the transformational generative framework. 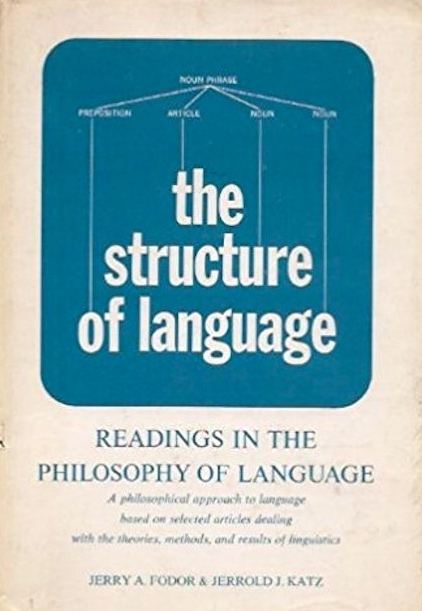 In their lucid and substantive introductory essay, the compilers establish the need for a “new approach” by demonstrating that ordinary-language philosophy and positivism fail both “to provide an understanding of the nature of language” (p. 1) and to reveal “significant insights promising a systematic and comprehensive theory of language” (p. 3) and that the “incompatibility of their basic claims” is too great to permit any sort of combination which might yield an adequate theory (p. 1). Ordinary-language philosophers maintain that a formal theory of a natural language is revealing only in so far as it succeeds in repre enting the facts of the language. Positivists, on the other hand, maintain that the theory of a natural language is adequate in so far as it is formal and in so far as it succeeds in exhibiting the “systematic and coherent” features of the language. Both fail to come to grips with the essential fact of linguistic competence – namely, that the skills which a fluent speaker possesses enable him to construct and understand sentences of indefinite variety, including wholly novel ones, in his language. It is precisely this competence that work in recent empirical linguistics has attempted to characterize. The papers in this anthology demonstrate the extent to which this attempt has been successful and the extent to which a change in philosophy of language is both needed and possible. Grammar, V Semantics, and VI Psychological Implications. Each section is preceded by an introduction by the compilers. The selection of papers was guided more by the compilers’ estimation of theoretical significance than by representativeness, although the latter did play a role. The fact that some of the papers are not otherwise readily available enhances the usefulness of the book; in part, the inaccessibility of some of the significant papers motivated their selection. Section II includes papers dealing principally with the objectives of linguistic de- scription and the form of theories adequate for descriptions of natural languages. Many of the questions raised in this connection are special cases of classical problems in the philosophy of science. The papers are: Willard V. Quine’s “The Problem of Meaning in Linguistics,” Zellig S. Harris’ “Distributional Structure,” Noam Chomsky’s two papers, “Current Issues in Linguistic Theory” and “On the Notion ‘Rule of Grammar’,” and Paul M. Postal’s “Limitations of Phrase Structure Grammars.” All but the last are published elsewhere. Although all of these papers are highly significant, the first of the ones by Chomsky, really a monograph (a revision of his contribution to the Ninth International Congress of Linguists), is clearly the central paper; it is extremely broad in scope, discussing incisively most of the major issues concerning the goals and adequacy of linguistic theories. Section III is concerned with grammars qua scientific theories of the sentences of natural languages. The papers are: Harris’ “Co-occurrence and Transformation in Linguistic Structure,” Chomsky’s “A Transformational Approach to Syntax,” Edward S. Klima’s “Negation in English,” and Morris Halle’s two papers, “On the Bases of Phonology” and “Phonology in Generative Grammar.” These papers truly speak for themselves. Klima’s previously unpublished paper is one of the best examples of linguistic analysis available for a subpart of English grammar; it may, in fact, be safe to say that it is the very best. The other papers are already known as outstanding contributions to linguistic theory, although the theoretical significance of Halle’s “Phonology in Generative Grammar” (previously published in Word) is, perhaps, especially great. Section IV contains papers dealing with two different sorts of extensions of grammatical analysis. Harris’ famous “Discourse Analysis” (first published in Language) is concerned with the study of structural relations between sentences in a discourse, a subject about which a grammar for the sentences, per se, has nothing to say (aside from certain, probably informal, observations about pronominalization in adjacent sentences). Harris’ paper is particularly significant in modern linguistics, since the transformational framework of Chomsky developed directly out of this attempt to extend grammatical analysis to discourse and its exposure of the inability of modern linguistics formally to account for certain systematic relationships between sentences. The other papers in this section deal with the study of deviant sentences – they are: Chomsky’s “Degrees of Grammaticalness,” Paul Ziff’s “On Understanding ‘Understanding Utterances’,’’ and Jerrold J. Katz’ “Semi-sentences.” The first of these originally appeared in Word under a different title. The last two are published for the first time in this anthology – they confront the following fact about linguistic competence: a fluent speaker’s skills enable him to use and understand not only the grammatical sentences of his language, but also strings which deviate to some extent from full grammaticality. The two papers represent different approaches to the description of these skills. The papers in section V, as the compilers note, represent the heterogeneity which characterizes work in the field of semantics. The compilers’ own contributions in this section, however, demonstrate that semantics is something other than a complete nonissue in linguistic theory. The papers in section V are: Rudolf Carnap’s “Foundations of Logic and Mathematics,” Alonzo Church’s “The Need for Abstract Entities in Semantic Analysis,” Quine’s “Speaking of Objects” and “Meaning and Translation,” the compilers’ co-authored work, “The Structure of a Semantic Theory,” and Katz’s “Analyticity and Contradiction in Natural Language.” All but the last have been published elsewhere. For linguistics, the outstanding contribution here is “The Structure of a Semantic Theory” (first published in Language). The important insights in semantic theory represented by this work, possible because of earlier insights deriving from work on transformational grammar, have had their effect on grammatical theory in turn – they have required a serious re-examination of the position of transformational rules vis-a-vis the underlying configurations provided by the phrase structure component of the grammar (see Jerrold J. Katz and Paul M. Postal, An Integrated Theory of Linguistic Descriptions, M.I.T. Press, 1964). Section VI is concerned with psychological investigations of language undertaken from the point of view that the ability of human beings to learn a linguistic structure is innate. The papers are: Chomsky’s “A Review of B. F. Skinner’s Verbal Behavior,” Eric H. Lenneberg’s “The Capacity for Language Acquisition” (a revision of an earlier published paper), and a previously unpublished paper by Morris Halle and Kenneth N. Stevens, “Speech Recognition: A Model and a Program for Research.” The findings and hypotheses of investigators operating from this point of view are highly compatible with certain basic assumptions underlying the generative transformational view of grammar, and conversely, the latter view of grammar has made it possible to achieve important positive results in support of certain psychological models. Current activity (both experimental and purely theoretical) in this area is, in my opinion, one of the most significant developments in modern science. The papers in section VI are mainly theoretical, but this is not meant to imply that little of importance is being done currently in experimentation. 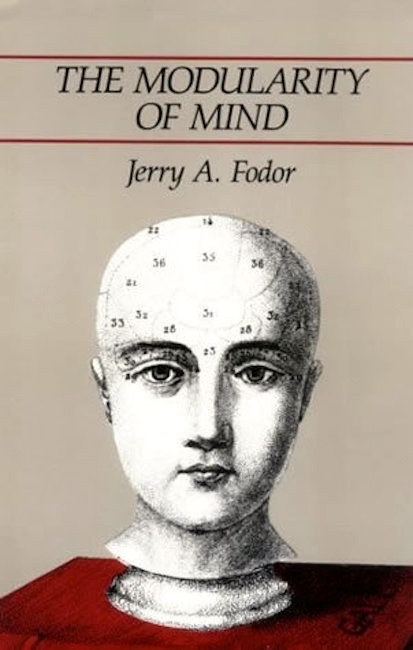 At least one of the compilers, Fodor, has himself been involved in experimental investigations on the perception of linguistic segments, the results of which are certainly not without theoretical significance. In conclusion, the reader should perhaps be warned that this book represents essentially a single, albeit complex, theoretical framework. From the tenor of this review, it can be seen that the reviewer believes it to be the best one so far available. This is not to say that our insights cannot deepen further or that there are no things still at issue. Far from it. But I feel safe in predicting that future advances will be made by building on the foundation represented in this volume. This entry was posted on December 21, 2017 at 6:22 pm and is filed under Death notices, Linguists, My life, Philosophy, Semantics. You can follow any responses to this entry through the RSS 2.0 feed. You can leave a response, or trackback from your own site.